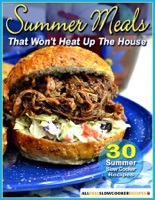 Forget your oven, and make oven-free summer recipes using your slow cooker with the help of this eCookbook, Summer Meals That Won't Heat Up The House: 30 Summer Slow Cooker Recipes. This eCookbook is packed with summertime slow cooker recipes for any occasion, whether you're hosting a social gathering, bringing a dish for a potluck, or planning a summer, weeknight meal. In our collection of 30 summer slow cooker recipes, you'll find slow cooker summer recipes for slow cooker appetizer recipes, slow cooker drink recipes, slow cooker main dish recipes, slow cooker side dish recipes and slow cooker dessert recipes.